Making a mural is a great opportunity for learning, especially cooperative learning. When I was teaching PreK I had a very spirited class and although I made many missteps as a new teacher one thing I did well was to encourage cooperative art projects when bad behaviors started popping up. Murals aren’t only great for making kids work together they are also wonderful for long term projects, getting up from the table to learn and encouraging kids to use proper hand form for writing while writing and drawing on vertical surfaces. Each of these mural art projects for kids has other more specific learning goals like shape recognition, counting and fine motor skills but the emphasis is always on fun. I love that you can put a mural up and it can we worked on all day. 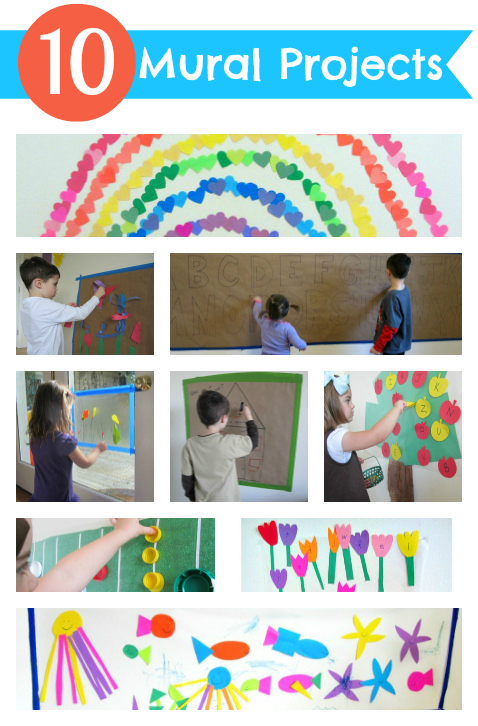 Love this post!I shared a sticky wall activity today and included a link to this post. Thanks for introducing us to sticky walls! We would hang up a long piece of brown craft paper and have the children paint it accordingly. maybe brown for bottom or green and then blue for sky. Great round up! I also didn’t know that vertical murals help with the grip – thanks for sharing! Love your ideas as always. Whenever my kids have painting/ colored on the walls my first thought is ” well good practice…” .